To celebrate the Spring’s arrival we propose you the Chick’s brioche bread, a preparation that, thanks to blast chiller LIFE, will be easy and fast. The function levitation helps you to save time, ensuring the correct development of yeastes. Heat the milk foe few minutes until 37° C, add the yeast and the milk and mix until the dissolution. Pour all in a bowl. Be careful that there aren’t lumps, add slowly sifted flour, eggs, butter, vanilla extract and a pinch of salt. Knead up to get a soft dough. Spread the dough with a rolling pin until you have a thin sheet, long and narrow shape. Pleat on itself as a fabric forming different layers. 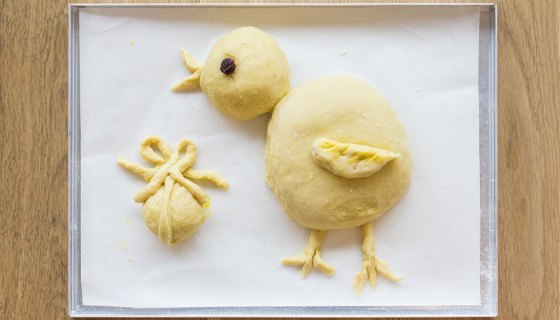 Divide the mass obtained in two parts: the larger one will become the Chick’s body while the smallest will be the head; keep aside some scraps of dough to form the legs, the wing and beak. Place the dough on the blast chiller LIFE’s baking sheet covered with baking paper, remembering to leave 2 cm of space between the head and the body of the chick. Sets the leavening : LEVITATION ˃ IMMEDIATE at the temperature of 28° C for 2 hours and 30 minutes and START. If you want to find the dough perfectly risen up to 24 hours distance sets the same parameters as the temperature and decide the cooking time. At the end of levitation LIFE brush the Chick’s brioche bread with egg yolk, milk and sugar and bake for 15 minutes at 175° C.